Valentine’s Day is just around the corner, and if you have a derby loving sweetheart in your life, well chocolate and flowers might not cut it. 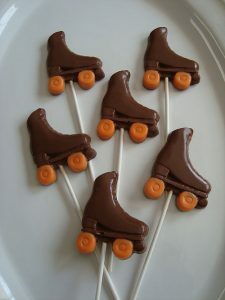 Here are some things that would make Suburbia Roller Derby members’ hearts skip a beat this February 14th. And flowers are nice, too!! 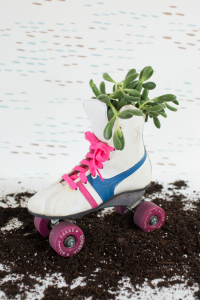 If you’ve got some time and an extra pair of skates lying around, DIY your way to your Valentine’s heart with this project. Sometimes a practical gift is the most meaningful of all. Protect the smile that warms your heart with a mouth guard! Derby is mostly about skating, but it’s also a little bit about having an awesome sock collection. These LOVE socks will definitely be a hit (and they happen to be Suburbia colors)! 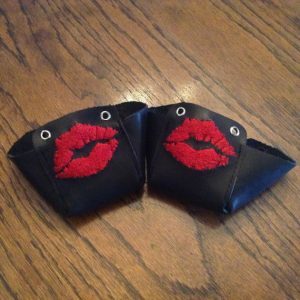 How about some kisses that will be sure to tell your Valentine that you worship the ground they skate on? 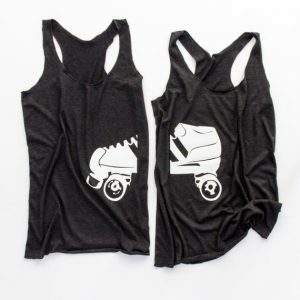 Maybe the special person in your life is your Derby Wife?? Show the world who’s always got your back, on or off the track. 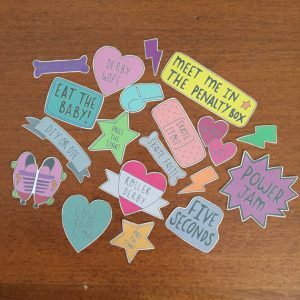 Let your Valentine know you’ll always stick with them with these super adorable derby stickers! And, we couldn’t resist throwing in some jewelry. 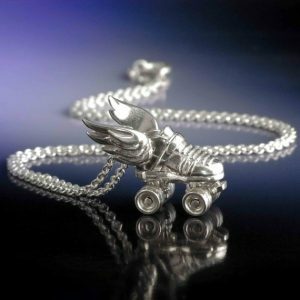 If your derby love goes wild for shiny things, how about this necklace that is sure to give the message “you’re my superhero!”? Of course, the best gift is your support. Derby is hard work and between practice, cross-training, travel, and bouts, it may feel sometimes like your derby love spends more time on derby than they do on you. A great way to maximize your time together and show how much you care? Get involved! Volunteer to run the merch table at the next bout. Cheer from the bleachers. Maybe even become an NSO for the league! And if you do that, you might just end up with the whole team singing your praises! I have the necklace and it’s beautiful with a good weight to it, spinning wheels and everything!